July 23, 2015 March 25, 2016 Pilar B. 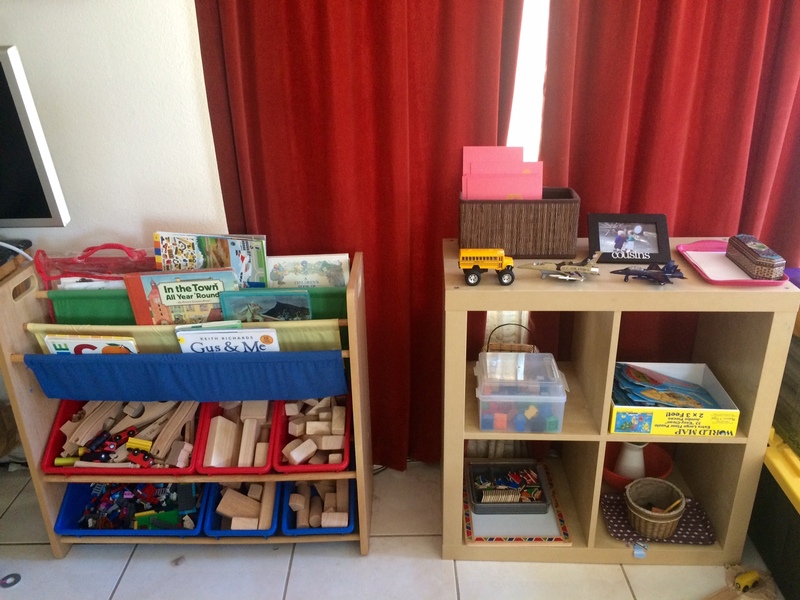 With the birth or our daughter, I found myself slacking off in the “Montessori parenting” department. Gone are the days when Zach and I could spend 30 minutes cooking together, and my patience and resolve are minimal these days due to sleep deprivation and meeting the needs of a tiny human 24/7. When I started noticing that my 3-year old was acting a little like an entitled brat, I knew that the changes to his lifestyle were to blame; I realized I had to modify his environment, routine, and expectations to nip this issue in the bud. Our meals are a lot simpler now that I have to juggle a baby, but I am trying to include Zachary in the meal prep at least twice a week. It can be as simple as scooping frozen peas into a pot of water, but at least he feels like he’s contributed to the evening meal. I’m also encouraging him to dress himself, because we had gotten into the habit during the school year of helping him with his clothes to speed up the process and be on time for school (yes, even Montessori teachers take shortcuts!) He has been helping my husband with simple repairs around the house and has been helping me with things like bringing the box of wipes during the baby’s diaper change. To help Zach feel less entitled and more of a contributing member of the family, while avoiding becoming a nag about chores, I wanted to set up a Responsibilities Chart. I don’t have time to make my own, and online at first all I found were sticker charts that reward children for behaviors that shouldn’t need to be rewarded. Then I found this AWESOME chart called “Do-N-Slide”. It comes with a label for each day of the week, along with about two dozen pictures of child-friendly chores most three-year olds can do on their own. I picked out the ones that were relevant to our home, Zach and I talked about them together, and then I invited him to choose five chores for one day. He slipped them in his chart and as he completed them, he moved them from the “To Do” side to the “All Done” side. Some chores he was already familiar with (like clearing the table) while others required a brief presentation and some patience (like putting the clean laundry in his closet). I have to make sure the environment is set up for him to be successful (i.e. make sure the watering can is on the porch, leave his laundry in a basket in his room, and clear a space on the kitchen counter so he can successfully place his dish and cup there) but a little effort on my part goes a long way! Zach’s toys and books were getting out of hand. We got him a few extra toys to keep him entertained while I cared for his sister, but they somehow all ended up on his limited shelf space, which made for some massive chaos! He was being careless and messy, and it was stressing me out. Seriously, who needs Duplos AND Legos?! His books were in two massive piles in the bathroom and in his bedroom, and he would only request the same few books over and over. After a particularly stressful incident involving clean-up (or lack thereof), I hit rock bottom and put about half his toys in a storage box. I made careful choices about what to leave out: Legos, train set, wooden blocks, a numbers activity, a shapes activity, a science activity, a geography puzzle, a few crayons and blank paper, two airplanes and a bus, and the sandpaper letters. I also carefully selected a few quality books and placed them facing outwards in his new bookshelf. 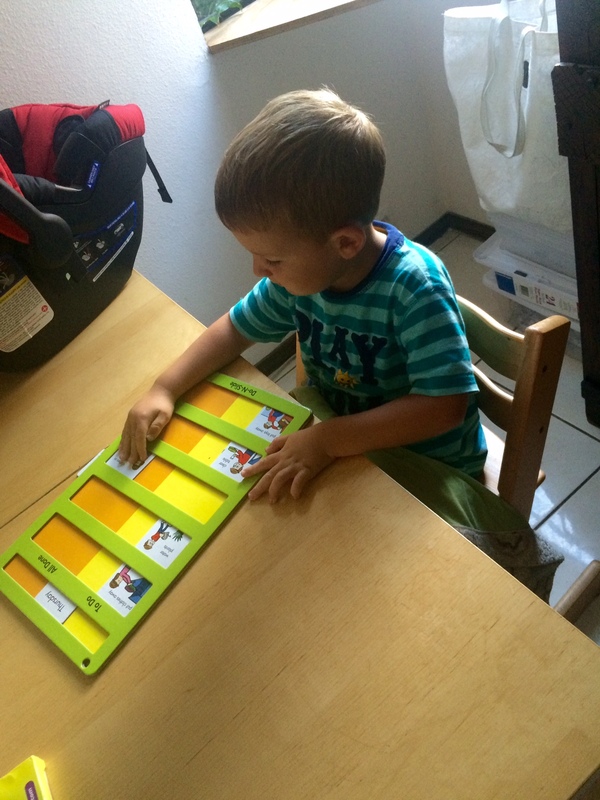 The change was positive: He began playing with the blocks and then the geometry material, both of which he hadn’t touched in weeks, and he also repeated the science experiment three times. Eventually, he asked for one of the toys in the storage box, so I invited him to pick one toy to put away for each toy he wanted to take out. This has worked beautifully and I’m a lot less stressed because there’s a lot less mess! I chose to keep Zach home over the summer instead of sending him to Montessori summer camp so we wouldn’t have to rush in the morning and so he could bond with his sister. While this was the right decision for us, it also meant that the burden of keeping him going on his burgeoning reading, writing and math skills would lay on me. He had *just* started reading three-letter words when school let out for the summer, but I know he still doesn’t know all the letters of the alphabet. He was not the least bit interested in doing three-period lessons and kept rejecting any activity that reminded him of school, so a few days ago I introduced the “sound of the day”. Based on whatever conversation we’re having as a family in the morning, I’ll pick a sound from the Sandpaper Letter box and feature it in a see-through napkin holder (for example, we had read a book about a “giggling gull” so the sound of the day became the “g”). 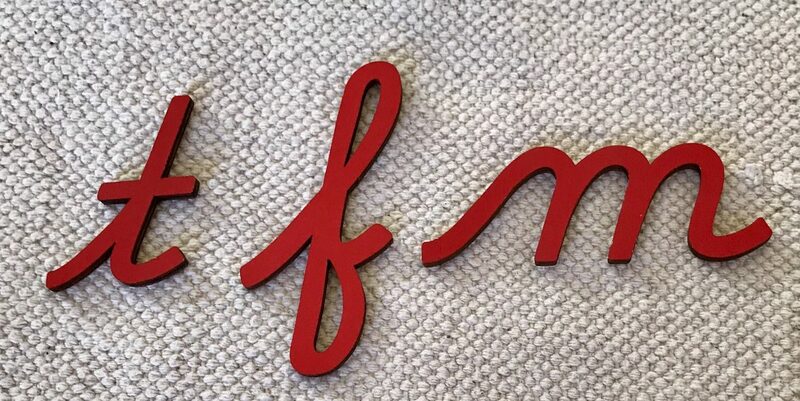 The entire family takes turns tracing the letter and we all think of words that start with that letter. Then, throughout the day, I’ll casually bring Zach’s attention back to the letter if he uses a word that starts with that same sound. It’s worked BRILLIANTLY and is a low-stress way of introducing the sounds! 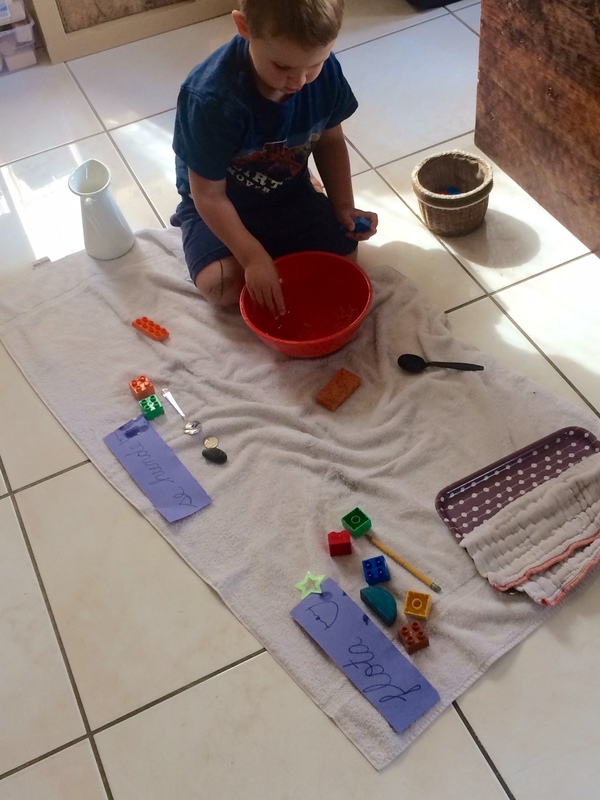 I also put together a simple “Float or Sink” activity with objects I had around the house, and have started introducing the concept of numbers through making and labeling Duplo stacks (in lieu of the Number Rods). I’m working on other easy-to-make activities like matching hardware store paint chips at a distance and then later finding objects around the house that are the same color as the paint chips; assorted punching activities; and a couple of sewing activities. I’ll try to post them as we try them out. Getting back on the Montessori wagon after lowering our standards hasn’t been a walk in the park, but when I feel like throwing in the towel after butting heads with a three-year old I think of the long-term repercussions, and it gives me the strength to take a deep breath, walk away to regroup, and try again later.